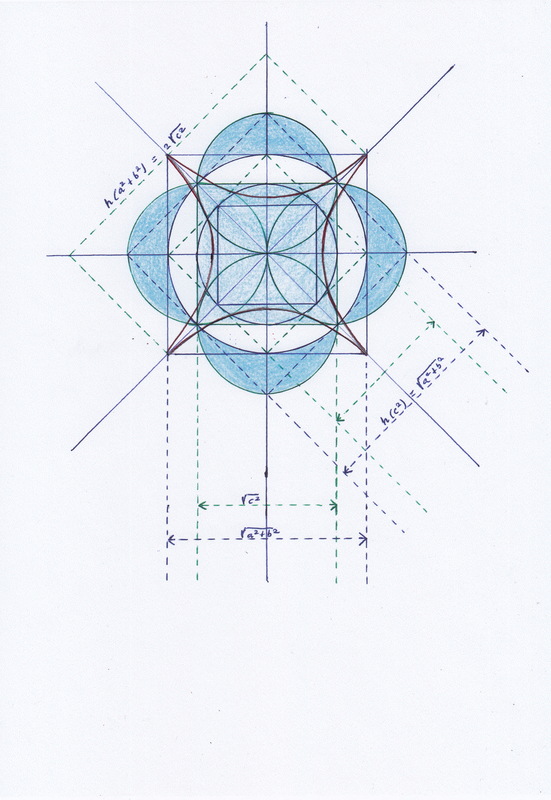 Differential Geometry in the Pythagorean Theorem. 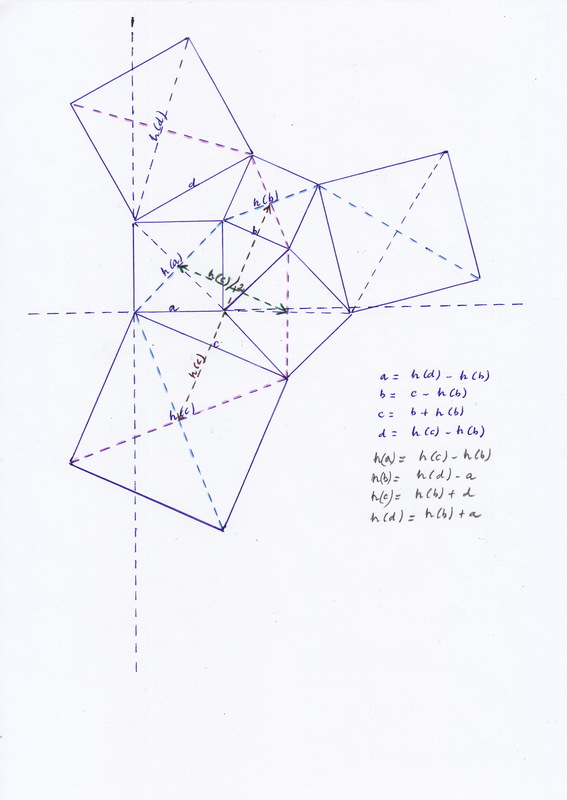 Exploring heuristically the Pythagorean theorem by means of differential geometry it appears that when ‘a’ and ‘b’ are not equal there is no equivalence between the internal and external elements of the quadratic system. It seems the broken equivalence could be saved by combining the parabolic and hyperbolic geometries, or by using periodically variable or rotational squares but, in those cases, the compared areas would be equivalent or coincident, not equal. When a and b are equal in the Pythagorean theorem we can clearly understand that the areas of a^2 and b^2 are “coincident” with the area of c^2 because the irrational internal elements (the hypothenuses) and the rational external elements (the root squares) of a and b are equivalent to the irrational external elements (the root squares) and the rational internal elements (the hypotenuses) of c^2. In that case, the 8 sides (root squares) of a^2 and b^2 are equivalent to the 4 hypothenuses of c^2 (it is necessary to consider each side of the two hypothenuses), and the 8 hypothenuses of a^2 and b^2 are equivalent to the 4 sides of c^2. In this sense, it is evident that c will be equal to h(a) or h(b), that h(a) + h(b) is equal to 2c, and that a+b is equal to h(c). The problems arise when a and b are different (by example if ‘a’ is larger than ‘b’). In that case, h(a) will be larger than c, and h(b) will be smaller than c.
We could reasonably expect that – for making a^2+b^2 coincident with c^2 (I explained in other posts why I think they are not equal but coincident) – the length differences between the elements of a^2+b^2 and c^2 are compensated in some way. I think when we say that a^2 + b^2 = c^2 and so that c is equal to the root square of a^2 + b^2, we are not comparing a^2 and b^2 with c^2 – we are not comparing ‘c’ with the root square of a^2 + the root square of b^2 – we are comparing ‘c’ with an abstract square formed by the fusion of the areas of a^2 and b^2. That abstract square a2^b^2 has an area whose external and internal elements should be equivalent to the elements of c^2. Here, the internal and external elements of a^2b^2 have an average value; can we get the specific value of the hypotenuse of a2 or b^2 by using the value of c? or can we get the specific value of ‘a’ or ‘b’ considering the value of h(c)? I think these questions are similar to those that appeared when the differential calculus was created in the XVII century. In a graphic that represents distance (x) and time (y) we can know the specific velocity of any point when the velocity is constant, because although we only get an average velocity for an interval that average velocity is always the same for any point of the straight line. But when the graphic is a curve because the velocity is not constant, we need to use another tool for calculating the velocity of a specific point, the derivative. The case of a = b would correspond to the graphic of a straight line, a constant velocity on the above example; the values that we work with are average values but also we can get from them the specific values. The case of ‘a’ not = ‘b’ would correspond with the graphic of a curve, and if we want to get the specific values of a^2 and b^2 [ a, b, h(a), h(c) ] we will need to follow a procedure that is similar to the one used in the differential calculus. This is what I thought when I started drawing these pictures. The slope of c projected over a^2 is given by the point where c becomes tangent to a.
d(a) and d(b) would represent the ‘h’ used on the derivative, tending to a limit equal zero given by the corner of a^2 or b^2. When we complete the whole figure c^2 projected over a^2 and b^2 we see an inclined parallelogram. But now we see that h(c) is larger than the root square of a^2 + b^2, because a^2 +b^2 are placed on the point where the limit is zero while h(c) is displaced from it on the root square of a^2. a + b and h(c) are separated by d(a) tending from zero to 1. TO save the equivalence of the areas of a^2+b^2 and c^2 there must be necessarily an element in the system that compensates that different (or differential) increment of the value of c^2 with respect to a^2 +b^2. So, when a and be are not equal, if h(c) > a + b then h(a) must be > c in the same proportion given by d(a) tending from 1 to zero. So the equivalence of the areas is saved because of the differences between the internal and external elements of the quadratic system are compensated. There are other evident relations here, for example, that c + d(a) = a + b. 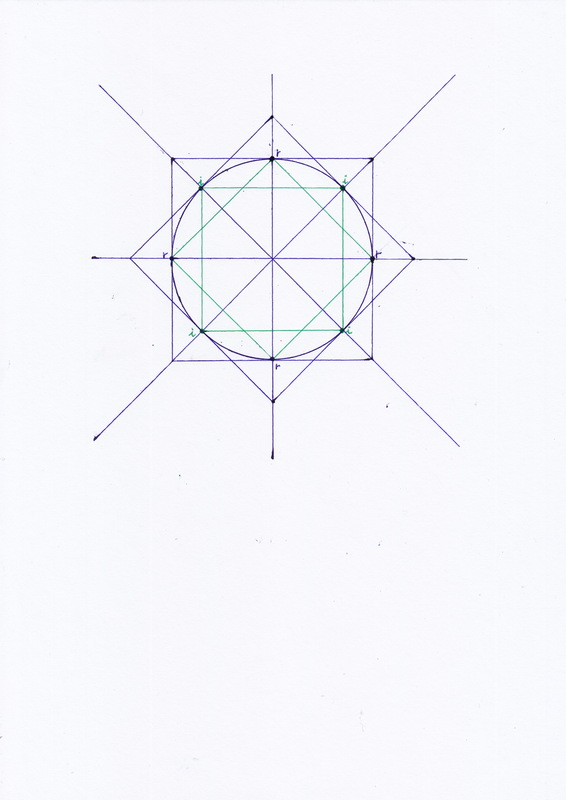 On the other hand, considering two concentric squares, and representing a^2 + b^2 the square exterior to a circle and c^2 the interior squares, the lengths of the internal and external elements of those squares are coincident in the same way that appears when a = b. But here it’s evident that the exterior square is larger than the interior one, and so a^2+b^2 would be > c^2. A possible explanation for this apparent incongruence with the Pythagorean theorem could be that here it comes to squares of variable length, expanding and contracting periodically. Another possible explanation is that the Pythagorean squares here have curved sides with opposite curvatures (signs) and amplitudes. In that case, the areas would become compensated by incrementing in a positive parabolic way the curvature of the sides of the internal square and decrementing in a hyperbolic negative way the curvature of the sides of the external square. So the internal “square” would be formed by hyperbolic/concave/- curvatures and the internal “square” would have parabolic/convex/+ curvatures. The parabolic curvatures create the so-called “Hippocrates’ moons” or “lunes”; the four moons (each moon has as diameter the side of the interior square) have the same area than the interior square; is a for of quadrature known since the V century BC. 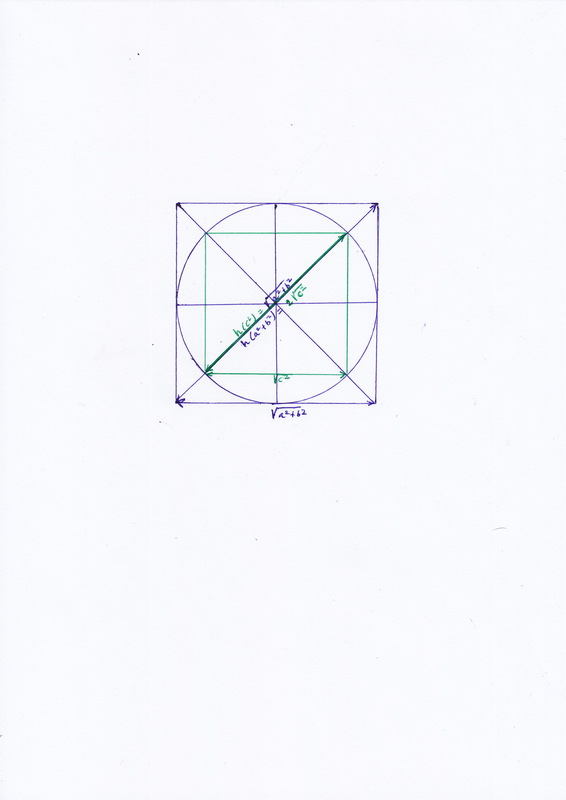 When it comes to comparing the perimeter of a circle and its diameter it appears the same kind of incongruence mentioned above between the lengths of the specific elements of the system when a is not equal b. The system is equivalent as a whole although at particular spaces /times experiences periodical increments or decrements. I think that the Z coordinate is not a coordinate of the plane of XY; when we displace Y towards Z or X towards Z, we introduced a new plane (a new flat layer over our flat space, if you will) that rotates and is displaced with respect our static plane XY; by making that we change our original referential metric, the rational one, and create a new referential metric, the irrational, which cannot be directly measured with the rational one. When we work with a circle, the length of the radius remains constant because of its tangent line – the perimeter of the circle – is a curve. But the length of the radius would be incremented if it followed a tangent line describing the perimeter a square whose root squares had zero curvature. I think the circle is a complex figure formed by two kinds of referential metrics, “gauges” if you will, the rational and the irrational ones, given by the concurrence of two kinds of symmetries. The rational roots of the external square touch the circle at the rational X and Y coordinates and the rational hypotenuse of the irrational internal square touch the circle at the irrational Z coordinates. 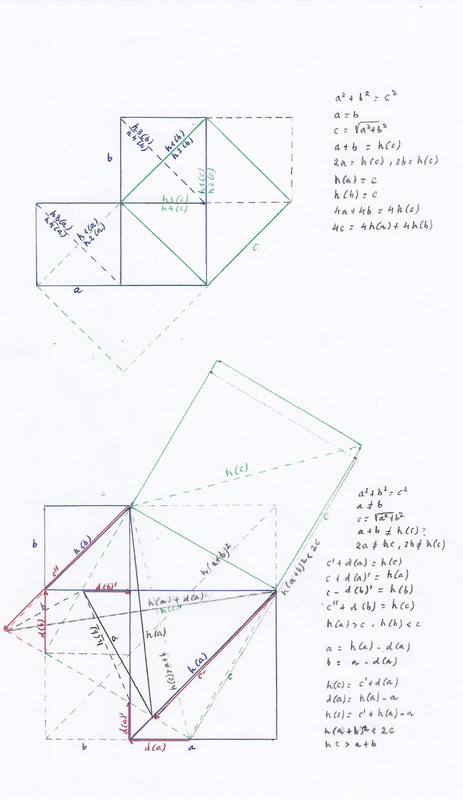 Z coordinates are irrational from the point of view of the external square but they are rational from the point of view of the internal one whose hypotenuses are rational. While X and Y are rational from the point of view of the external square but they are irrational from the pint of view of the internal square whose roots are irrational. When measuring the perimeter it appears a precesion that I think is caused because of the different referential metrics that rule the XY and the Z coordinates, because of the displacement of Z with respect to Y or X. That displacement has the same effect as if we expanded the space when the increment appears while displacing Y or X towards Z or as if we were contracting the space when the decrement appears while displacing Z towards Y or X. The length of the radius is constant but the referential metrics of the internal and internal squares, we always measure in terms of squares with roots with zero curvature, change. The increments and decrements of the referential metrics of the external and internal squares are compensated in the system as a whole that the circumference is but they appear uncompensated when we perform measure at a specific point. When measuring its perimeter, the precession appears, and we get an unreasonable result, the infinite decimals, by comparing the diameter and the perimeter as if they both were following constantly the same rational symmetry of the external square whose root the radius is. 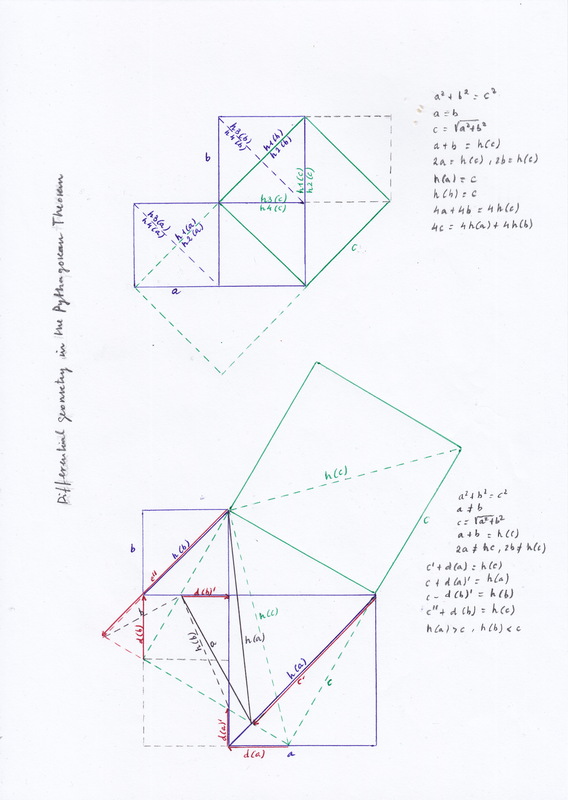 On the other hand, we also could examine the Pythagorean theorem when it comes to internal and external squares rotating with different phases. In this case, when the internal square is rotated it will touch the perimeter of the circle with its rational hypotenuse at the rational coordinates XY and then there will be a length decrement at the irrational Z coordinate that will compensate the increment that takes place at the XY coordinates when the rational hypotenuse of the not rotated internal square touches the circle at the irrational Z coordinate and the rational side of the external square touches the perimeter at the XY coordinates causing the differential and temporary increment. In any case, it seems the squares of the Pythagorean theorem would not be equal because they will have opposite signs (with inverted curvatures) or opposite phases of rotational movement. They would be coincident or equivalent. On the other hand, when the angle formed by a^2 and b^2 is different than 90 degrees, the elements of the quadratic system do not have equivalence and the Pythagorean theorem does not apply. In that case, though, we must look for the equivalences between the derivative squares. It also should be necessary to look for the equivalences of the system when it comes to a, b, c raised to a power giger than 2.